Ebola transmission rate: The virus doesn’t spread as quickly as measles and other diseases. Ebola Is No Measles. That’s a Good Thing. Comparing this virus to scourges of the past gives us hope that we can slow it down. Health workers in protective suits stand outside a Doctors Without Borders Ebola treatment center in Monrovia, Liberia, on Oct. 1, 2014. The Ebola outbreak that is ravaging West Africa is the worst in the history of this virus, which produces ghastly symptoms that include fever, vomiting, diarrhea, muscle pain, confusion, and—perhaps most frighteningly—bleeding from the eyes and ears. More than 6,500 people have been reported ill, and at least 3,000 people have died in Guinea, Sierra Leone, and Liberia. 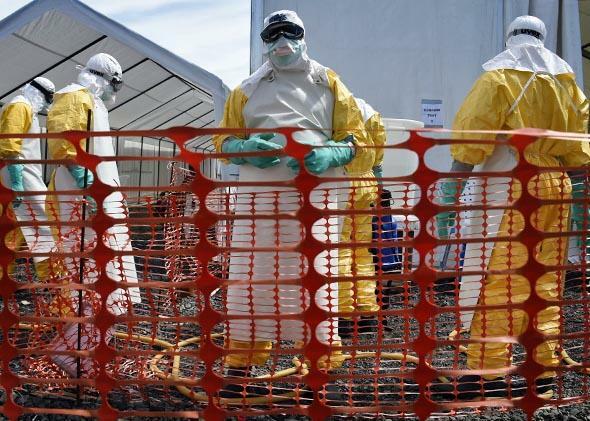 Two of the world’s top health agencies—the World Health Organization and the U.S. Centers for Disease Control and Prevention—warn that this Ebola epidemic is spiraling out of control. As a mathematical epidemiologist, I can tell you—despite the disclosure of a U.S. case in Dallas—that there is some good news. While no one disputes that this Ebola outbreak is terrible, it is only spreading moderately as compared with scourges of the past, which gives us hope that we can slow it down. The key is to detect an Ebola outbreak in its early stages when the numbers of cases are manageable. I first worked on Ebola back in 2004 as part of my doctoral dissertation modeling how the virus is transmitted and controlled at Cornell University under the supervision of Carlos Castillo-Chavez and collaborators at Los Alamos National Laboratory. Ebola was an interesting case study for our mathematical modeling, as there were two relatively large and well-documented outbreaks where the impact of efforts to control the virus was evident (the 1995 outbreak in the Democratic Republic of Congo—formerly known as Zaire—and the 2000 outbreak in Uganda). It was intriguing—not to mention scary—to work on a disease that produced such a set of horrific symptoms with a fatality rate above 50 percent. The number of people now infected with Ebola is skyrocketing, but Ebola isn’t the fastest-spreading disease in human history. That distinction goes to measles. In the era prior to 1963, when children were first routinely vaccinated, each case of measles created 17 new secondary cases, with transmission spreading like wildfire in schools, especially. It was lethal in as many as one out of three or four cases worldwide, especially when medical treatment and nutrition were poor. * At this rate, getting infected with measles during childhood was inevitable. It was really only the advent of routine vaccination that helped public health officials get measles under control. Of course, reproductive rate isn’t the whole story. Measles’ reproductive rate dwarfs that of the “Spanish flu”—the pandemic of 1918 to 1920 that many call the worst in recent history. Health researchers have found the Spanish flu produced, on average, between two and five more victims for every case. And while that’s much lower than measles, Spanish flu was still able to find new victims at a rapid enough clip to spread worldwide. In large part, that had to do with influenza’s short generation interval—which means only about two to three days elapse between the first case and a generation of secondary cases. It doesn’t take long for the flu virus to settle into a new host and a substantial number of transmissions can occur even before a person realizes that he or she has the flu. And flu—like measles, but unlike Ebola—can be spread through the air, making it only a cough or a sneeze away from infecting a new host. In the early 20th century, efforts to control the spread of the disease included closing schools and prohibiting large public gatherings, but these efforts only delayed the full impact of the pandemic. Eventually, an estimated 30 to 50 million people around the world died from the Spanish flu. Ebola’s reproductive rate is significantly lower than either measles in the prevaccination days or the Spanish flu, but it’s high enough that Ebola will not peter out on its own. Our 2004 work, which produced the first estimates for Ebola’s reproductive rate by using mathematical modeling and epidemiological data from the West African outbreaks, found that each case of Ebola produced 1.3 to 1.8 secondary cases on average. This ongoing outbreak, a colleague and I recently found, has a reproductive rate that is about the same. If allowed to spread unchecked, Ebola retains its ability to get out of control. But at least this is essentially the same virus we saw previously. It hasn’t become more transmissible in the more than 10 years it was lying low—and humankind has experience in dealing with it. We know that it takes substantial contact for Ebola to spread: Someone has to touch or ingest infected body fluids. So last time, health care workers contained the outbreaks by isolating infectious individuals; providing more gloves, face masks, and gowns in hospitals and clinics—and requiring nurses, doctors, and other health care providers to wear them; having trained personnel handle the bodies of the deceased (rather than allowing family members to commune with the body, as favored by many West African cultural traditions); and tracing contacts from infectious individuals immediately to isolate potentially new infectious cases. To break the chain of the current Ebola outbreak, our numbers show that health care workers need to halt about 50 percent of infectious contacts by effectively isolating people who are infectious or vaccinating at least the same fraction of the population. Unfortunately, a licensed vaccine—like the one that has worked to control measles and the one that is reformulated each year to battle the most common strains of flu—is not yet available for Ebola. And, more critically, the countries suffering from outbreaks have weak health care systems (though the one in Guinea appears to be faring better than those in Sierra Leone and Liberia). Not only do these countries lack gloves, gowns, face masks, and other essential supplies to protect nurses and doctors from infection and from further spreading the infected fluids from one person to another; they also don’t have an adequate surveillance system to catch and identify Ebola cases in a timely way. Delays in detecting outbreaks have led to more infections. In addition, the number of doctors in the most affected Ebola areas is dismayingly small and the number of health centers is scarce. For instance, Liberia has only about 50 doctors for a population of 4.4 million. Ebola cases quickly filled hospitals, and it’s clear that more treatment centers need to be set up quickly. The lack of experience in these West African countries—because Ebola has not struck them in the past—has also contributed to delays in developing measures to educate the public about how they can avoid contracting the disease. Still, the numbers do show that health care workers trying to control Ebola have something else in their favor: The time that elapses between the first Ebola case and the generation of secondary cases is about two weeks. This should allow for plenty of time to identify those who are sick and protect people who might come in contact with them. Individuals with Ebola are only contagious and able to transmit the virus when they are showing symptoms, which occurs about a week after they are first exposed to the virus. This likely explains why Nigeria has been able to break the chain of transmission, as Nigerian health authorities detected the first Ebola case in their country only three days after that person’s arrival from Liberia by airplane and acted quickly to isolate infectious individuals and trace their potential contacts. Nigeria has observed 20 cases where Ebola was transmitted, with no new cases reported as of Sept. 8, 2014. Up until this year, textbooks have described Ebola as the type of infectious disease that could cause no more than a few hundred cases in hard-to-reach forested areas of Central Africa. Little attention or funding has been focused on Ebola, unfortunately, since health policymakers thought it would never escape its remote home base and infect large numbers of people. But while the virus has not changed much in more than a decade, many parts of Africa are very different. People live in much denser quarters where the introduction of a new disease is now more likely to take off. The population is also much more mobile than ever before, with a noticeable fraction of the population commuting between rural and urban areas and routinely crossing unprotected borders via roads or by airplane. This increases opportunities for the virus to reach new areas where new chains of transmission can grow and become established. Math and history show us that decisive efforts to isolate those who are infected with Ebola and to follow up with potential contacts quickly can help to get an outbreak under control. We’re lucky that we have such capacities in the United States. Even though we now have one case in Dallas, it could not get much of a foothold; the patient is in an isolation ward. But our world is interconnected in ways it never was before and diseases that require substantial contact to spread aren’t the only things circulating. If a virus like Ebola can quickly flare out of control, consider the impacts of a novel strain of influenza.